we regret that you’ve been experiencing issues with your product post-installation, as we never want our customers to be disappointed in the products they receive. We understand that we’ve spoken to you and scheduled an inspection so that we can better review your concerns. 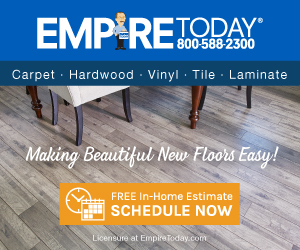 Please don’t hesitate to contact us with any additional questions at 888-588-2315 x4195 or customersupport@empiretoday.com. carpet sheds ,stopped up vacuum cleaner ,black lines in carpet ,called customer service after carpet was installed ,no one called back this carpet was installed in living room ,dining room and hall way . Lowe's installed carpet in three bed rooms, better sales people ,much better carpet and excellent customer service lesson learned . Review #309902 is a subjective opinion of brutis.